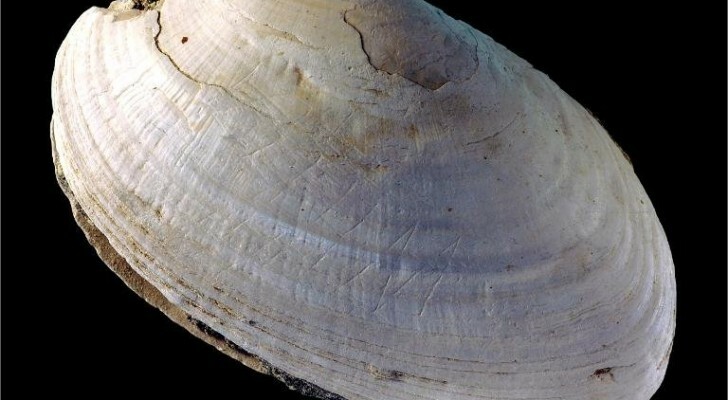 A team of researchers from Leiden University in the Netherlands have discovered what appears to be the oldest known engraving in human history. The geometric marks were found on a fossilized mollusc shell that dates back approximately 500,000 years ago. In colonial-era Indonesia, 166 freshwater muscle shells were found at Trinil, a common digging ground for paleontologists and anthropologists. The shells were found on the banks of the Bengawan Solo River, in the Ngawi regency of the East Java Province. It’s a well known spot given the fact that it’s the site that Dutch paleontologist Eugene Dubois discovered the famous “Java Man,” the first early hominid remains to be found outside of Europe. As reported in the Journal Nature, the team at Leiden University, led by Josephine Joordens used modern day technology to analyse the Trinil shells that were found at the site. Carbon dating of the sediment in the shells put their age between approximately 430,000 and 540,000 years old. “It’s the oldest known graphic expression. The behavior is deliberate . The individual had the desire to make a zigzag pattern in a single go. We don’t know why he did it. It may have been the mark of ownership, a personal code, a gift. ” – Francesco d’Errico of Bordeaux University in southwestern France. Geometric marks like these are considered to be a sign of cognitive behavior and neuromotor skills that – previously – have only been attributed to modern man. This thought, however, has now changed and these findings are sufficient evidence to attribute these characteristics to Homo erectus, which completely shatters the modern day stereotype of H. erectus, which is one with very limited cognitive ability. Findings like these are truly remarkable and shed light on just how little we really know about our past. Furthermore, discoveries that change the current framework of knowledge are not always publicized. Evidence: Did Electricity Exist In Ancient Egypt? Man discovers ancient tunnel leading to Egypt's Great Pyramid under his House!